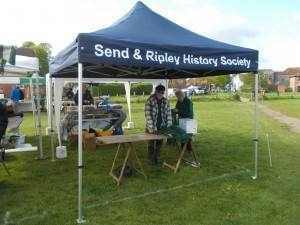 The society sometimes have a stall at the Ripley Farmers Market where you can come and talk to us and learn more about the History Society and the work we do. Visiting Ripley Farmers’ Market is the perfect way to purchase fresh, local goods direct from their growers and producers. 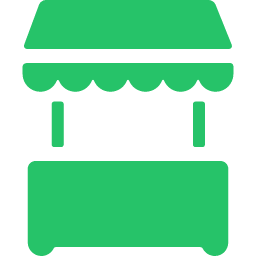 The market consists of a wide array of seasonal farmed or produced goods as well as other items such as speciality foods, crafts and locally grown plants. Many of our markets are themed throughout the year, with demonstrations and activites to keep the whole family entertained. From dog shows to cookery and farming demonstrations, we have something for everyone. Ripley Farmers’ Market is a charity run entirely by volunteers, with all of our proceeds going directly to local charities and organisations, which are also welcomed at our Community Stall. If you wish to represent a local cause at our market, please get in touch. The monthly market is a great social hub for the local community, with a wonderful atmosphere created by friendly stall holders and local visitors. See our calendar for upcoming dates and events. There’s free parking and dogs are welcome, so your morning can be truly hassle free. Come and buy local in the fresh air on Ripley Village Green. For more information on local produce in the Surrey area, you may also wish to visit surreyfoodlinks.co.uk & www.goodfoodpages.co.uk or www.localfood.org.uk forcountrywide information. 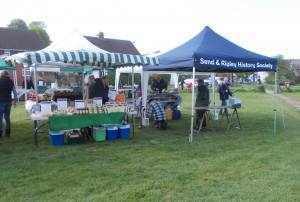 Below are two photos of the first outing for the society’s new gazebo at the Ripley Farmers’ market on May 6 2015; Les & Anne Bowerman setting up on a windy morning.